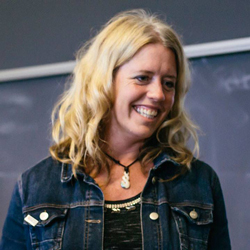 Sheri Potter, BS, is a social intrapreneur with a strong commitment to developing more effective strategies to connect people to science. Among other things, she has been the director of community and stakeholder engagement for the Association for Women in Science, the leading advocate for women in STEM. She has also been a project director for SciStarter implementing a collaborative program to bring citizen science to classrooms, hand-in-hand with NASA’s GLOBE initiative and National Wildlife Federation’s Eco-Schools program. Sheri’s personal mission is to build a scientific citizenry of people who understand how science works, why science matters, and what scientists do – and to help them connect that knowledge with their own lifelong journey as a citizen who benefits from, participates in, and uses science. Sheri worked at the American Institute of Biological Sciences for over ten years in multiple capacities, including as director of membership and public programs. She helped launch the Leadership in Biology initiative, Coalition on the Public Understanding of Science, ActionBioscience.org and Year of Science 2009. Sheri earned an Executive Certificate in Social Impact Strategy from the University of Pennsylvania and has a bachelor’s degree in biology. Sheri connects cool people to cool people to spread ideas and opportunities that promote people using and celebrating science.